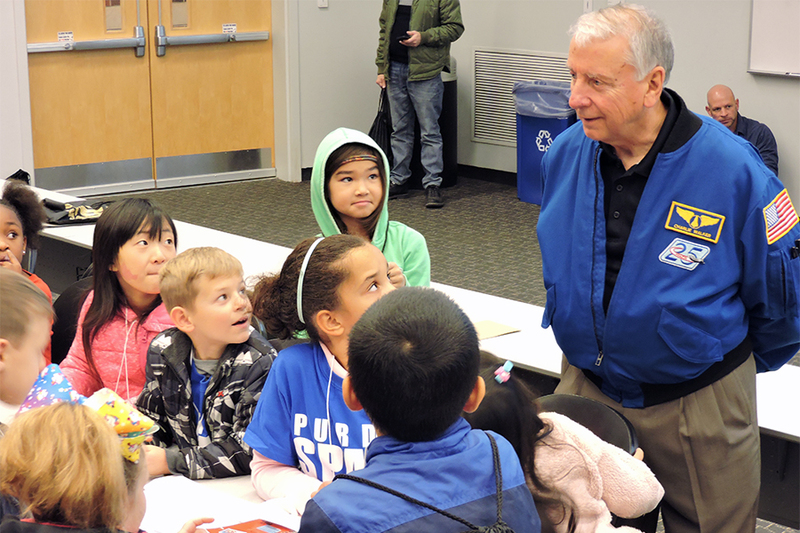 About 850 children in grades third through eighth attended the 23rd annual Purdue Space Day with special VIP guest Charlie Walker, an astronaut who flew three NASA shuttle missions. One girl, having just completed assembly of a straw rocket, clapped loudly and pumped a fist before a loud “yes!” escaped her lips. Later, a boy literally jumped, contorting his body in the air, and, upon landing, shook both arms in excitement. He’d just seen the execution of a dry-ice launch of a paper rocket, complete with a loud pop as it shot off the pavement. Later, a group of children had mouths open wide and heads cocked back, looking up toward the second-floor bridge in Neil Armstrong Hall of Engineering. A Purdue student volunteer was getting ready to drop another experiment, a kid-assembled Mars Lander, to see how sturdy it'd be on landing and how well it’d protect its marshmallow cargo. The kids offered up a dramatic countdown, heard from well beyond the building’s atrium, and celebrated a successful landing. 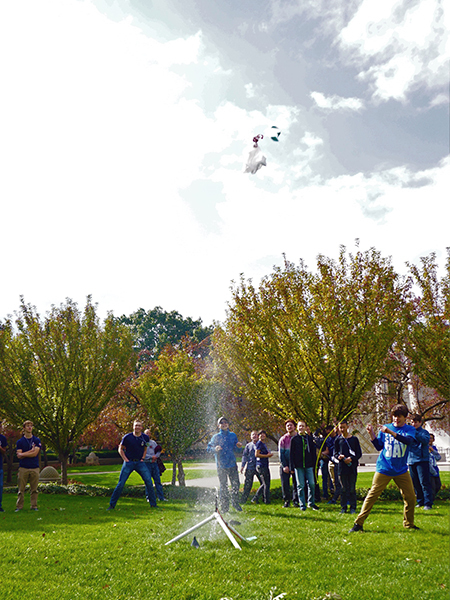 Purdue Space Day accomplished its mission, again, Saturday. The program, offered to children in third through eighth grades, seeks to inspire the next generation of space explorers by participating in age-appropriate STEM activities with a space theme. This year’s theme was “Blast from the Past” — and it reached an unprecedented amount of children. 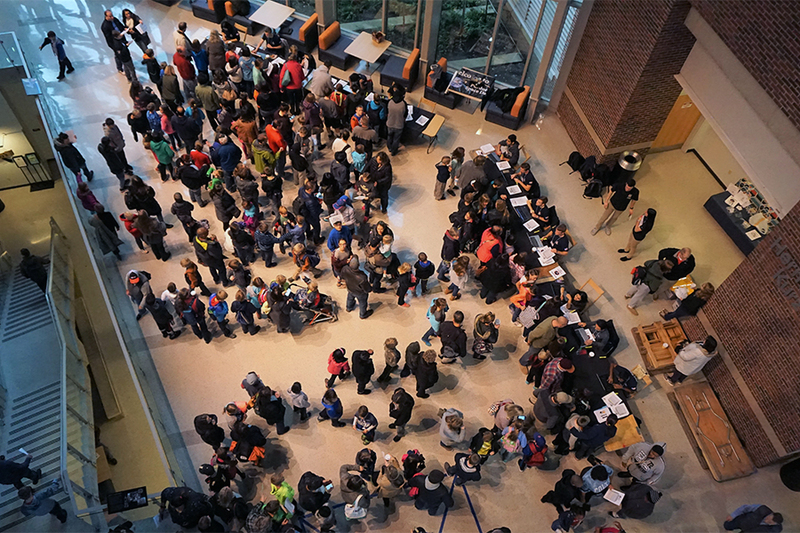 Purdue Space Day (PSD) set a program record with about 850 participants. Collicott says she heard a fifth-grader perfectly define aerodynamics, in technical terms, and she was in awe. That’s probably how most of the kids felt when they were in the presence of the day’s VIP guest, astronaut Charlie Walker (BSAAE ’71). Walker, who flew three NASA shuttle missions, says he has lost count at how many times he’s participated in Purdue Space Day — either three or four — but he has never been hesitant to return. “Why come back to a glorious alma mater like Purdue University? Why come back to a world-class music hall like Elliott? Why come back to be able to talk to hundreds of students who are interested in science and technology and are the future of American science and technology as well as an informed electorate in a representative democracy? Why come back to enjoy the company of the great folks, students, volunteers and administration here?” Walker says in mock offense at the question. He opened Purdue Space Day in Elliott Hall with a presentation that included details about his missions, a video about what life is like in space, and emphasized studying hard and never giving up on dreams. After the presentation, Walker answered questions ranging from what astronauts eat in space to how astronauts keep time in space to when astronauts will visit Mars and many more. Though Walker identifies himself as an introvert, he certainly was able to capture the kids’ attention and consistently prompt reactions from the group. “I’m passionate about this because these kids are the future,” Walker says. Walker saw that promise in practical ways throughout the day. 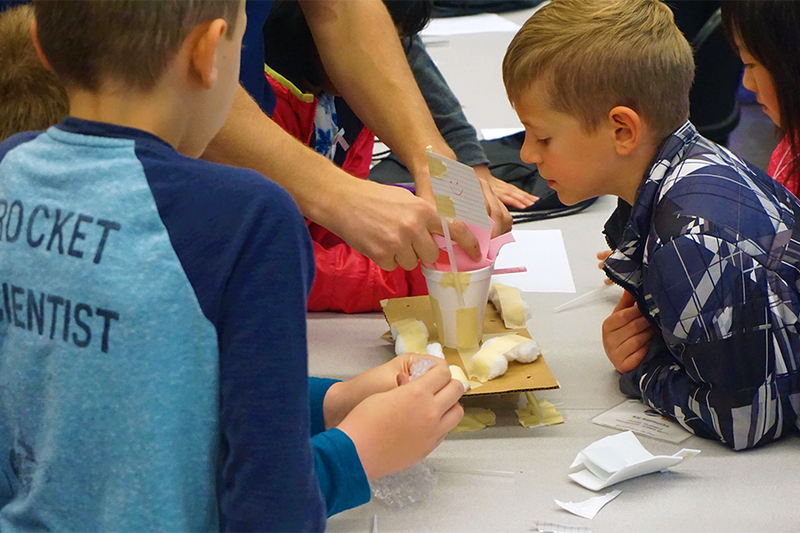 He popped in on activities — nine were offered — and interacted with children, watching their minds and hands work, to design, build and test a variety of experiments. Kids were enamored when Walker was in the classrooms with them, but they also were able to get a sense of Walker’s genuine, welcoming nature. That’s what Purdue Space Day Director of Activities Sarah Baxter, one of nearly 350 Purdue student volunteers, hoped. Though Walker may be the draw for some kids and their parents — registration filled up in only 13 minutes this year — learning those STEM skills is vital, too. And that will continue to be the emphasis of the program, which also has outreach throughout the year. “I think it’s really important to do this kind of outreach and STEM advocacy, and it’s especially important for people in institutions of higher learning to do it,” says AAE Ph.D. student Geoffrey Andrews, PSD’s outreach coordinator. “I think there’s all too often a divide between scientific research and communication beyond the scientific community, and I think stuff like this is something that helps to bridge the gap. Those interested in volunteering for Purdue Space Day or its year-round outreach events can contact psd@purdue.edu.